Back in the first week of February, we attended the World of Concrete 2016 show. We saw a lot of great innovations spanning the entire concrete and masonry industry. One of the innovations in the tool realm was at the Makita Tools Booth. They had 3 new heavy duty impact tools, two impact wrenches and an impact driver. Of the new Makita impact tools, the wrenches are of particular interest to me in my current company. We’re a commercial general contracting company that specializes in concrete and steel buildings. 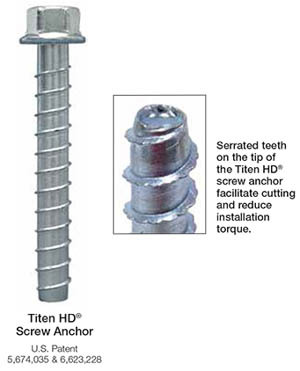 This means that we do a ton of heavy duty anchoring to concrete and masonry. Right now we only have two corded impact wrenches to share between 6 trucks. 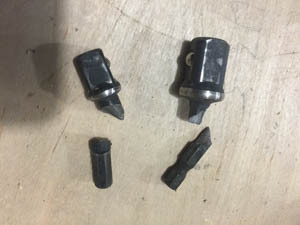 Often times when the impact wrench is on another truck we end up using our impact drivers with a socket adapter to drive in the large screw anchors. Sometimes it works and sometimes it shells the adapter. Even if the wrenches are available there often isn’t onsite power on the job site yet so a corded tool is useless without a generator. After using the Makita impact tools at WOC, I can’t wait to get at least a couple of them for our trucks. Driving large screw anchors often results in this. 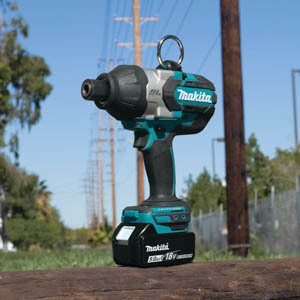 La Mirada, Calif. – Makita® has released three new cordless high-torque fastening solutions that meet and exceed corded demands. The three new 18V LXT Brushless Cordless Impact Tools include the ¾” Square Drive Impact Wrench (XWT07M/Z), ½” Square Drive Impact Wrench (XWT08M/Z), and 7/16″ Hex Chuck Impact Drill (XWT09T/Z). All three models deliver the highest fastening torque in their categories. 18V LXT® Lithium-Ion Brushless High Torque 3/4″ Impact Wrench Kit (XWT07M). Also available in 1/2″ and 7/16″ Hex. The Makita 18V LXT® Lithium-Ion Brushless High Torque 3/4″ Square Drive Impact Wrench includes a ¾” anvil with friction ring and thru hole retention system for maximum productivity. The XWT07M/Z delivers a full 780 ft.lbs. fastening torque, the highest in its category, and 1,250 ft.lbs. breakaway torque. The electronic 3-speed power selection gives users precise fastening control for a range of applications. The efficient Makita brushless motor is engineered for longer run time, increased power and speed, and longer tool life. Additional features include all-metal gear housing with rubber overmold, rubberized soft grip, built-in dual L.E.D. lights, and less weight (only 8.1 lbs. with battery). It is ideal for a range of users, from iron and steel workers to pipe fitters, railroad and automotive mechanics, forming contractors, and more. 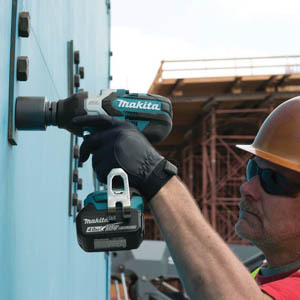 The Makita 18V LXT® Lithium-Ion Brushless High Torque 1/2″ Square Drive Impact Wrench includes a ½” anvil with friction ring for increased productivity. The XWT08M/Z delivers a full 740 ft.lbs. fastening torque, the highest in its category, and 1,180 ft.lbs. breakaway torque. The electronic 3-speed power selection gives users precise fastening control for a range of applications. The efficient Makita brushless motor is engineered for longer run time, increased power and speed, and longer tool life. Additional features include all-metal gear housing with rubber overmold, rubberized soft grip, built-in dual L.E.D. lights, and less weight (only 7.9 lbs. with battery). It is ideal for a range of users, from iron and steel workers to pipe fitters, railroad and automotive mechanics, forming contractors, and more. The Makita 18V LXT® Lithium-Ion Brushless High Torque 7/16″ Hex Impact Drill (XWT09T/Z) delivers a full 590 ft.lbs. drilling torque, the highest in its category. The electronic 3-speed power selection gives users precise fastening control for a range of applications. The efficient Makita brushless motor is engineered for longer run time, increased power and speed, and longer tool life. The tool hook and hanging ring provide added convenience. Additional features include all-metal gear housing with rubber overmold, rubberized soft grip, built-in dual L.E.D. lights, and less weight (only 8.1 lbs. with battery). It is ideal for linemen and electricians installing and maintaining power lines, wood boring, and more. Makita® is a worldwide manufacturer of industrial quality power tools and outdoor power equipment, and offers a wide range of industrial accessories. Makita utilizes leading-edge technology and innovation to engineer tools that are more compact with less weight yet deliver industrial power and results. Makita’s extensive line of cordless lithium-ion tools includes 18V LXT® Brushless Lithium-Ion, 18V Compact Lithium-Ion, and 12V max Lithium-Ion. Other best-in-class products include rotary and demolition hammers and saws equipped with Anti-Vibration Technology (AVT®), MM4® 4-Stroke engine power equipment, Super Joint System – SJS® grinders, miter saws engineered with Deep and Exact Cutting Technology (DXT®), Impact GOLD®, the New Gold Standard in Impact Driving, and more. Makita U.S.A., Inc. is located in La Mirada, California, and operates an extensive distribution network located throughout the U.S. For more information, call 800/4-MAKITA (800/462-5482) or go to makitatools.com. Follow Makita: facebook.com/makitatoolspage, twitter.com/makitatools, youtube.com/makitapowertools, instagram.com/makitatools.